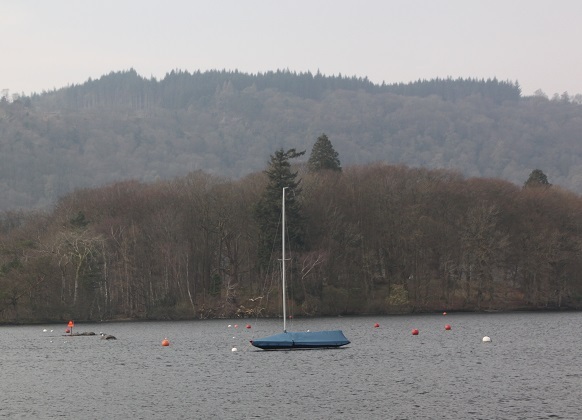 A while since we’d been to the Lake District, we decided to take a trip to Windermere, the largest of the English lakes. Having driven numerous times along the eastern lake shore and then cycled beside the lake to Wray Castle, this time we decided to take in the scenery from the water. 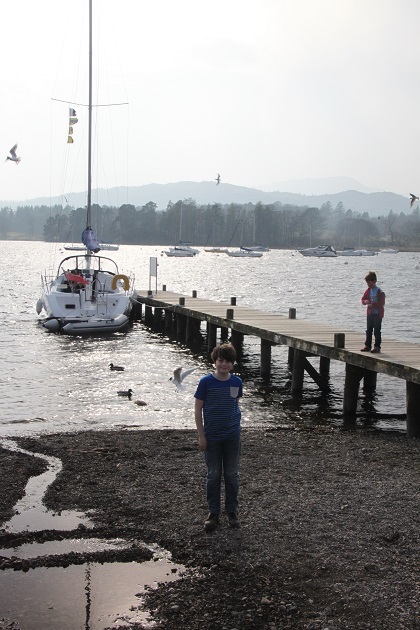 Not the first time we’d been on Windermere on a boat, when Son was little we took a Santa cruise. Magical and a really lovely experience but we didn’t pay too much heed to the scenery then. This time we decided to put that right. Parking spots in the bustling resort of Bowness-on-Windermere have always been like gold-dust on our past trips. This little place always seems to be busy and always full of people no matter when you visit. We did strike it lucky though finding a car park straightaway where spaces were available and better still, a ticket office nearby where we could buy a combined parking/lake cruise ticket. The icing on the cake – it was only a short stroll from the boat launches. 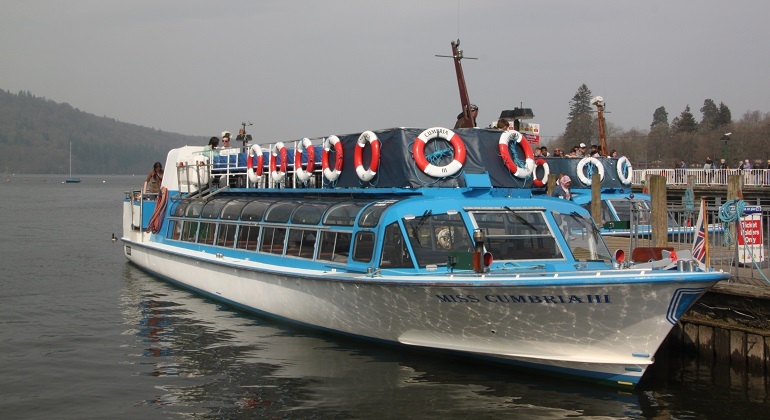 There are any number of cruises on offer from either Lakeside in the south, Bowness in the middle and Waterside (Ambleside) in the north. You can travel from end to end, do a circular cruise and choose any type of vessel from lake steamers to mid-sized modern launches and tiny little wooden boats. We opted for a cruise from Bowness to Waterside and back, up the lake on a mid-sized launch and back on a steamer. Availability for any of these options seemed to be no problem on the day. We arrived ten minutes before our departure time, took our seats up top and set off for a gentle cruise to the southern end of the lake. 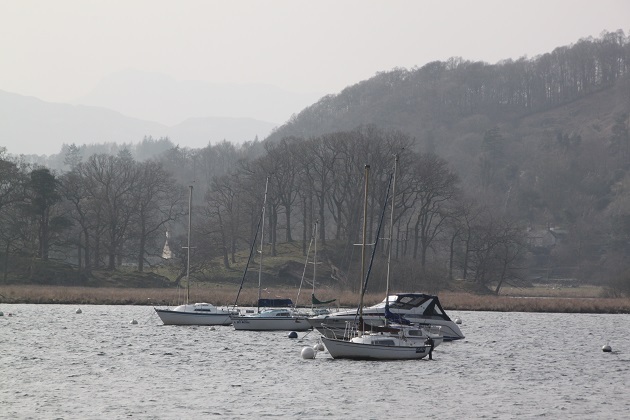 It takes about an hour to do the round trip, we decided to disembark at the two stops – Waterside and Brockhole. It felt very genteel and extremely pleasant to sail on this great expanse of water. You can well understand why tourists have been flocking here in vast numbers since the mid 19th century. The lake is 10 miles long and a mile wide, the waters were incredibly calm and without doubt this is a great way to savour the scenic wonders. We had a commentary as we sailed, the captain pointed out a few things of interest but I just focussed on those views – the shore line with wooded fells, hills and crags in the distance. 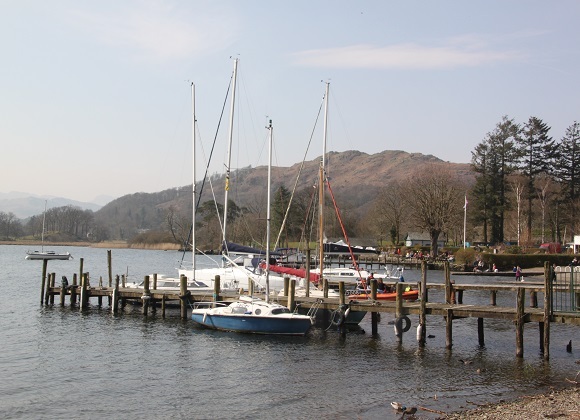 Our first stop was Brockhole, we walked from the jetty through a huge grassy area with people picnicking and relaxing. 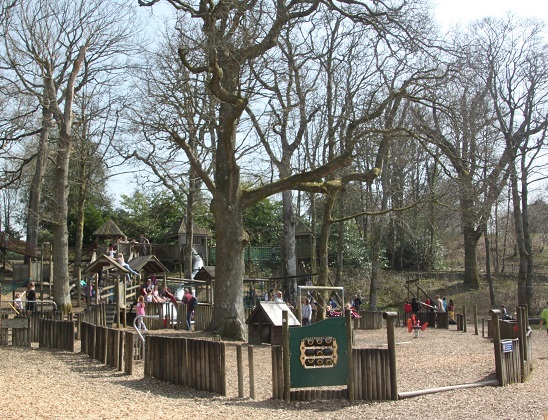 Son raced to an adventure playground and let off steam there for about half an hour. 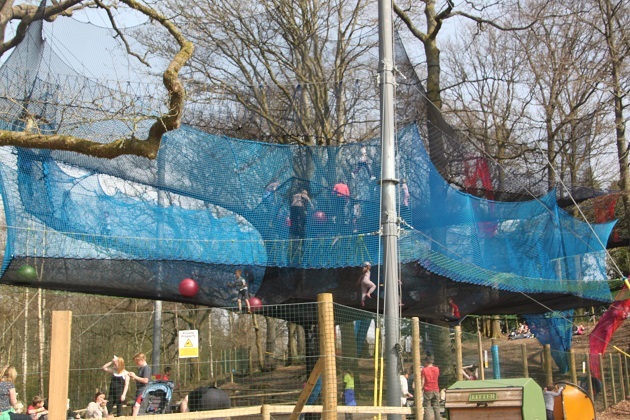 They had a tree top adventure course and a giant net thing suspended from the trees with crowds of excited children bouncing around in it. Son was keen but we were under time pressure – we vowed to return sometime for this. Just enough time to walk to the little visitor centre where we had drinks on the patio with a view of the lake before it was time to head back and catch the next boat. We got off again at Waterside – the stop for Ambleside – and decided to walk to the town. It took a while – just over a mile but we decided to stop and check out some Roman ruins first. The walk is away from the lake and along quite a busy road so not really as pleasant as I was expecting. Son moaned and groaned the whole way, however when he spied a pitch and putt course in the town his energy levels were miraculously restored. 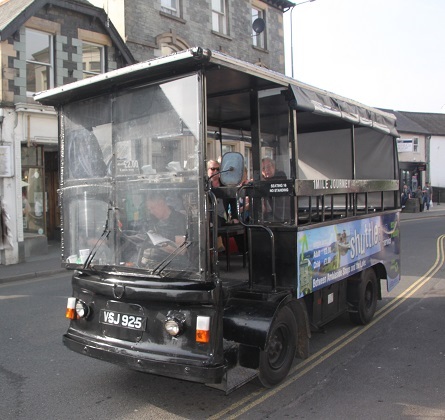 We wandered around pretty little Ambleside, found loads of bars, cafes and hiking shops and then decided to take the charabanc back to the jetty – a pleasant ride for £1 each and no moaning this time – win win. Back on the boat we spied Wray Castle and chilled as we glided back to Bowness. A lovely day out on the biggest lake in England, this is a magical place and definitely, I think, best seen from a boat. Thank you – it’s a lovely place! I don’t visit England enough (except London!). The little wooden boats on the shore are so picturesque, and look hand crafted? And the boat stops are like stepping back in time. It’s such a gorgeous, quaint and unspoiled place, it really does feel untouched by time and if you are lucky enough to have bright weather (we did that day!) then it is just stunning. I just love the Lake District when the sun shines and I know exactly what you mean about parking in Bowness! Your photos and commentary inspire me to visit again as I haven’t been for awhile. We actually spent our honeymoon at a hotel overlooking Lake Ullswater many years ago!! We used to go on family holidays when I was young and I’ve always loved it – every time I go back the scenery really does just blow me away! Bowness parking though, that’s (usually) a huge nightmare but we seemed to strike it lucky that day. Your post bought back some fond memories; thanks for sharing! Lake District is such a serene place. It is special – really scenic and gorgeous, every time I visit I fall in love with it a bit more! I cant believe I have never been to the Lake District 😦 Looks lovely…maybe one day we’ll make it there! Oh you have to go there, it’s just gorgeous. Quaint little villages, lovely views and some amazing walks too!! 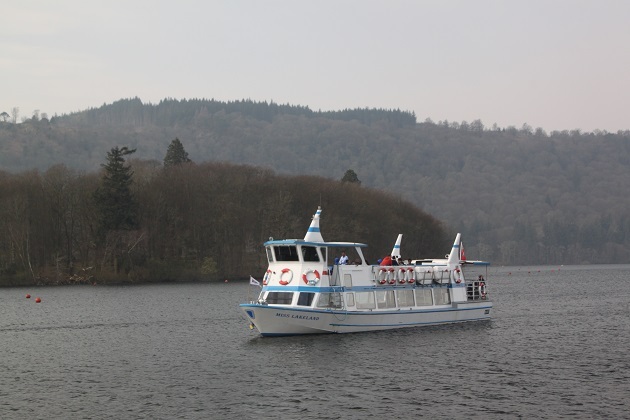 The Lake District is such a beautiful area – lovely photos and your post reminded me of my own trip there at Easter, I did the exact same boat ride though didn’t get off at Brockhole! Our son is a bit of a fidget so probably we wouldn’t have got off there either except to keep him happy!! It is one of my favourite places in England! It really is stunning, we love it whenever we go – hope you make it and get some good weather! That looks like a wonderful day out. I’ve been to the Lake District a few times but have not been to Windermere since my early teens. It’s interesting to see how much it’s developed since then. I don’t think we had the option of a cruise, just a wee pootle out on a row boat. I might be wrong though. I think I would have had difficulty dragging my kids away from that playground and my husband away from the Roman ruins. We used to go on family holidays there so I always love to go back. The boat cruises are so popular but great fun – we did have problems leaving that playground though Laura it must be said!! This all looks magical! I always try to find a boat trip when I travel–just love the view from the water. We do too, it’s fun and great to see the place from a different angle – this boat trip was just great. It’s really beautiful, so scenic and picturesque. Enjoyable post, Joy – with great photos as always! The Lake District is still on my wishlist – and I’d like to have enough time to explore the less visited areas because although it looks very beautiful, it also looks a bit ‘touristy’ and I like to avoid the crowds when at all possible. This is a very touristy part Susan for sure, always incredibly busy but like you say still scenic and lovely. The less crowded areas though are incredible. The Lakes are so beautiful. And they always remind me of “Swallows and Amazons”. Absolutely – me too, I always think that when I go there. It was a lovely day out Lauren, a boat ride, some exploring and a fun ride in an old vehicle – everyone was happy! Stunning pictures Joy and such a beautiful place! It is a lovely and special place Divya, we had such a nice day out there. One of my favourite areas, though we tend to avoid Bowness because of the parking and general busyness you mention. Hadn’t thought of a cruise though – good idea. 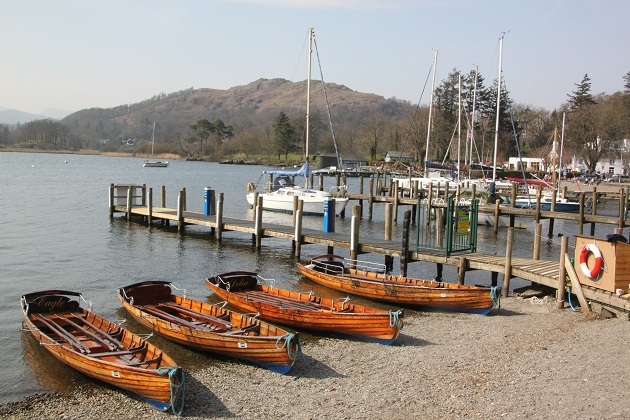 We’ve been on boats on Ullswater (now way for a walk back) and Coniston (to visit Ruskin’s house) in recent years though. 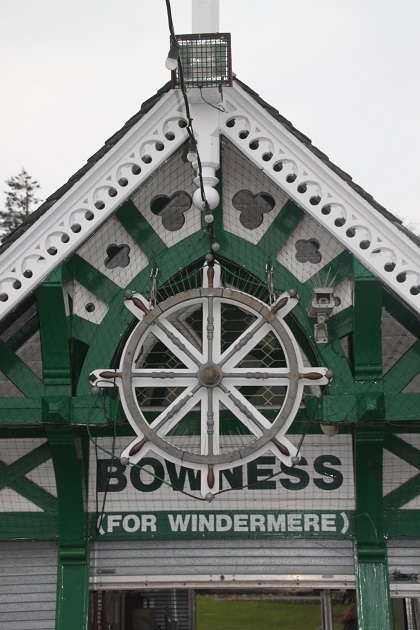 We opted for Bowness just because it’s doable in a day without needing to stay over. I keep saying though we must go for longer and further into the lakes – maybe will try those 2 alternatives Anabel! Oh i love the little wooden boats! Seemed a cold day, though? It started off cool, warmed up a little and then got chilly again so definitely not tropical weather!! But then it’s the English Lakes, we were actually grateful it was dry and bright – anything to avoid that rain!! It is a lovely area Suvi – lakes, gorgeous scenery and so much to see – we love it! The groaning and moaning – well that’s another matter as you know!! Great photos, Joy. What a quaint area to visit and relax. Is it a heavily populated area? It’s a national park George but not really very large in area – I think it’s about 40 miles north to south and 40 miles east to west. Full of lakes and mountains though and about 50,000 people live within the boundaries of the National Park. Loads of tourists visit and the little towns can get very busy but there are plenty of places you can get away from it all. We love it! So beautiful! 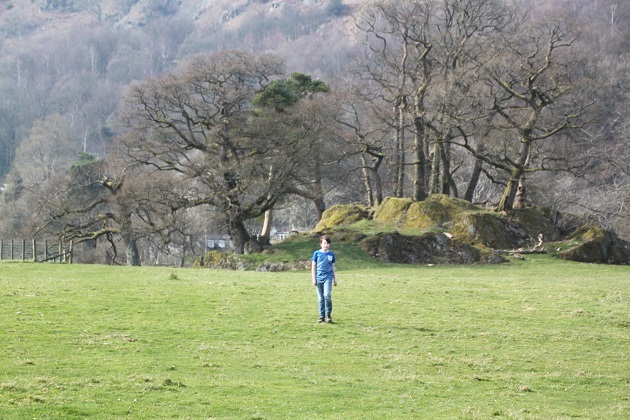 The walk to Ambleside looks especially charming – love that you happened upon Roman ruins.. I know, unexpected Roman ruins are pretty impressive!! The walk was lovely, just a shame our youngest family member was going for the world record in groaning…. Don’t laugh but I have always wanted to go there since I saw the guys from Top Gear film there a few times. It looks gorgeous. Top Gear always film in some great places!! It’s almost a travel show in its own right sometimes. I love the Lake District and haven’t been to Windermere for several years. We took the same boat trip, but you had much better weather than us! 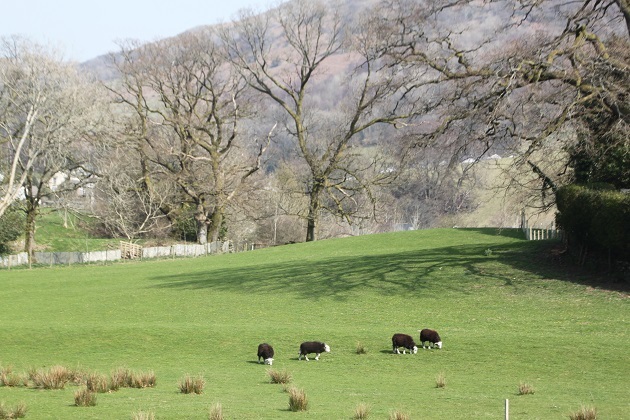 It was chilly but bright – you never know what you’re going to get in the Lake District though!! We were lucky, as soon as we stepped in the car to drive home the heavens opened and rain poured down – we left at just the right time. Joy, the Lake District looks like a fabulous place to visit! Hope to get back to England soon! Thanks for the lovely tour! It’s a gorgeous spot Pam, lovely scenery with lakes, mountains and some timeless quaint little villages, we just love it! Looks like a lovely day out in the lakes! Though Bowness can get crowded on weekends and in summer, it’s still a picturesque town with some great views and restaurants. You do have to go a bit further north to escape the crowds though! Grasmere and Keswick don’t get quite so packed in the summer and are great for hiking. I love Keswick, we used to go there on family holidays when I was a child. We tend to veer towards Bowness because we can do that in a day from home, I keep thinking we need to venture further up and stay over…. food for thought!! This looks like a lovely place; some of the photos of the lake with the tree speckled mountains remind me of summers spent at cottages in canada on our many lakes. It’s a gorgeous place – full of charm and character, definitely visit if you can!! We had such a great day out here Rosemary, relaxing on the boat but with the right amount of sightseeing and things to keep everyone happy! I also have fond memories of family holidays in the Lake District but as you say, I don’t think I ever appreciated the natural beauty and when my parents pointed it out to us it just went over our heads!! I think now the same thing is happening with my own son. School holidays next week – hurray – so we’re off to Holland this afternoon, driving to Hull and then taking the ferry – a first for us – so looking forward to a few days in Amsterdam and then we’ll be travelling around. Fingers crossed for sunshine – it’s here now so I hope it stays around. Hope you have a lovely weekend too. We sailed from Hull to Rotterdam too Rosemary – calm seas and a beautiful crossing both ways (thankfully!!). We actually stayed in Rotterdam on our last night – on board a yacht that used to belong to Maria Callas, we found it through Airbnb and it was superb. We only had a short time in Rotterdam but I quite liked it – especially Delfshaven where the Pilgrim Fathers left from. We were pleasantly surprised by Rotterdam Rosemary, mainly modern as it was flattened during the War but we enjoyed our brief stay there. I will (eventually) get around to writing about our trip, it takes me an eternity to sort out the photos!! I know the feeling Joy – am still sorting through the Lake Como ones! So many great shots – trying to collate them into posts is quite tricky! That’s a lovely river cruise! It was loads of fun, hopping on and off in the different little villages was great too. Lovely cruise. How did you get into the enclosure of the Roman ruins? My friends and I walked by the place a few times, as we were staying at the Ambleside YHA, but didn’t see any entry point. We just walked through a field from the boat and came upon them!! 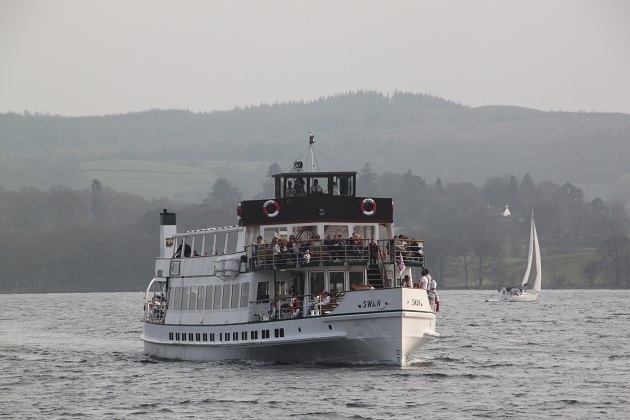 Thanks for a great write up of your day on Windermere and for speaking so favourably of our boats. If anyone would like to follow in Joy’s footsteps, we’d recommend the Red Cruise (Bowness > Brockhole > Ambleside-Waterhead > Bowness). The ticket allows you to get off at each stop, so you can hop off and explore, then continue your journey on a later boat. Thanks again for a great write up! I would love to go on a cruise on this lake. It is so picturesque! It is gorgeous, so peaceful and the scenery is amazing.